Long time, no update. My holiday from my real job is almost at an end, but the good news is that I have spent a lot of time with Icefall and it’s actually starting to come together! I had developed a lot of separate pieces of game infrastructure (random map generation, character creation, character death… etc), and over the last couple of days I have successfully integrated them all into the main Icefall build. This means that what I have now, for the first time, is a *fully* playable game! You start out creating a character, you can explore, find items, kill monsters, and be killed in turn. There’s still thousands of features missing (I had thought I was pretty well progressed on the UI side of things, but now the framework is in place, I can see there are quite a few gaps I need to fill in) but now I have something that feels like a game, I can start iterating on it and trying it out. I didn’t meet my goal of having it completed over Christmas, but at least I have made significant progress. Overall, I’m pretty happy with how far along it is. 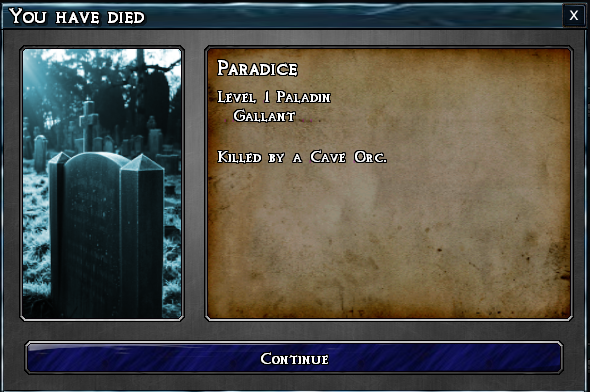 The Icefall death screen quickly becomes familiar. Admiring the hard work you put into your website and detailed information you present. It’s good to come across a blog every once in a while that isn’t the same out of date rehashed material. Excellent read! I’ve saved your site and I’m adding your RSS feeds to my Google account.